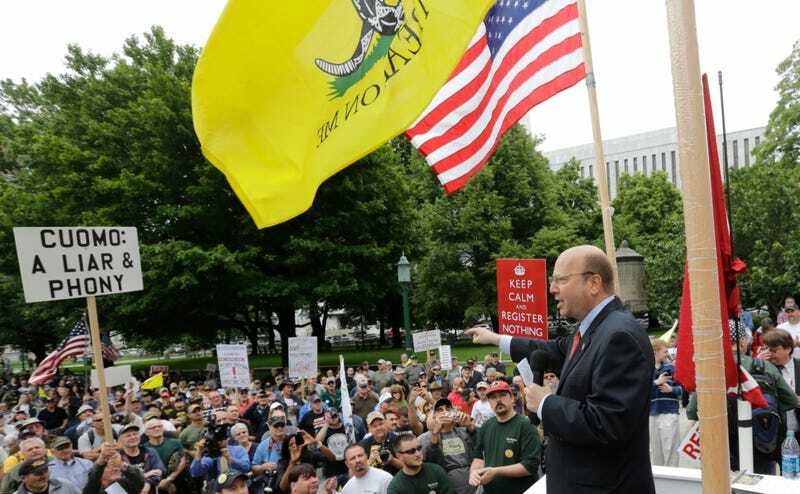 Last week, New York state assemblyman Bill Nojay fatally shot himself in a Rochester cemetery, just feet away from his family’s burial plot. Nonetheless, the New York Times reports, Republican voters are likely to cast their ballots for him in Tuesday’s primary at the behest of GOP and Conservative party leaders, who will then be able to pick his replacement themselves. Given the 133rd Assembly District’s deep conservatism, their pick is expected to win in the general election regardless of who it is. Nojay served as co-chairman as Donald Trump’s presidential campaign in New York state. He was set to appear in federal court on Friday to face charges that he’d embezzled $1.8 million from a legal client when he texted his lawyer to tell him that he planned to take his own life, the Rochester Democrat and Chronicle reported this weekend, though there has been some dispute over which client the charges involve. In Afghanistan, he was an election monitor with the International Republican Institute. In Odessa, Ukraine, he consulted on an election between pro-Western and pro-Russian candidates. In Iran, he held the title “director and secretary/treasurer of the Foundation for Democracy,” according to his Assembly biography. In Cambodia, which he said he had visited for various reasons since the 1980s, he started an agricultural marketing business with three partners, including Sichan Siv, the Cambodian-American former United States ambassador to the United Nations. The Akra Group, as it was called, solicited a $1 million investment from a wealthy Phnom Penh dentist around the end of 2012, said her American lawyer, Robert A. Simon. By 2014, Mr. Simon said, Akra showed no signs of marketing rice or of returning the $1 million, and his client, Dr. Lykuong Eng, filed a fraud complaint in Cambodia. Despite being tried in absentia on and off since 2014, Mr. Nojay had brushed off the Cambodian investigation. “He said there’s nothing to it, just a feud among partners — one of them was disgruntled,” said Bill Reilich, the Monroe County Republican chairman, who knew Mr. Nojay for 20 years. Mr. Nojay was, he added, “kind of nonchalant” about the matter. By this spring, federal agents in Rochester had subpoenaed documents related to the Cambodian investment from Mr. Simon, he said on Friday. According to the Democrat and Chronicle, however, the still-sealed fraud charges against Nojay did not have anything to do with Cambodia, or even the company he was a silent partner in that won a “tentative” contract to oversee a $1.3 billion Rochester schools modernization project. Rather, the charges stem from Nojay’s alleged embezzlement of $1.8 million from an escrow account he managed for his longtime client and friend, Carlton “Bud” DeWolff, an architect who’d been contracted to design a medical complex in Jordan, the King Hussein Center for Biotechnology and Cancer. DeWolff told the Democrat and Chronicle on Friday that Nojay had begun returning the money taken from the escrow account in recent weeks. The indictment remains sealed, and the Department of Justice did not immediately respond to Jezebel’s request for comment.